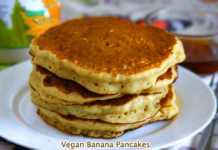 Vegan Sweet Potato Pancakes: After baking delicious vegan sweet potato brownies I had some leftover pureed sweet potato and while looking for recipes to finish it off I came across few sweet potato pancake recipes. 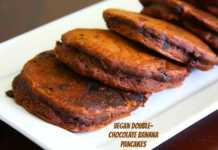 Earlier I had made the fluffiest vegan banana pancakes ever and used that recipe to come with my own recipe for these fluffy vegan sweet potato pancakes recipe. These no eggs sweet potato pancakes are also the perfect finger foods for babies and toddlers who are beginning to explore new tastes and textures. 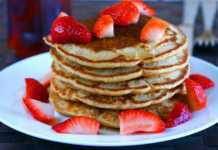 They are very soft so that they are easy for the kids to bite and chew, filled it with vitamin A rich sweet potato making the pancakes healthy and naturally sweet. Having leftover cooked sweet potato? Make these fluffy, whole wheat, vegan sweet potato pancakes that everyone will devour. Pumpkin puree is also a very good substitute for the sweet potato. So this will be a perfect pancake recipe during the busy Thanksgiving week! In another medium-sized bowl add the ingredients listed under the “wet-mix” one by one and mix well. Pour the wet mix into the flour mix and combine together until the flour is all moistened and mixed well. Few lumps are ok. Do not over mix. I added a tablespoon of water because I felt that the batter was too thick. Set aside the sweet potato pancake batter for at least 5-10 minutes. Heat a pan/griddle. Once it is warm enough add about 1/3rd of a cup of the pancake batter to the pan. You will see air bubbles forming indicating that it is getting cooked. Flip it over and cook it for another minute or so. 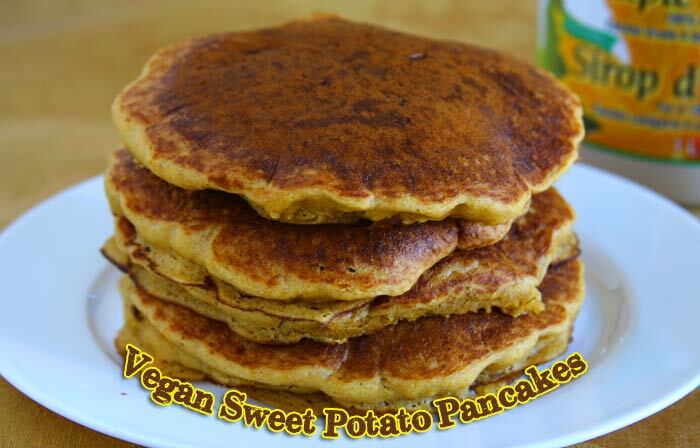 Warm vegan sweet potato pancakes are ready! Repeat it for the rest of the batter and serve it warm with maple syrup. These sweet potato pancakes were so soft and fluffy that it’s difficult to believe it’s vegan. It was neither too sweet nor bland. Also it didn’t taste like it was made with whole wheat flour. While making it for toddlers instead of making it into circles, use a spoon to spread the batter into a finger shape so that they can hold on to it easily and eat. Will it work without the apple cider vinegar? The texture might be a bit dense.